Afghanistan successfully held provincial and first-round presidential elections. Various folk are in the running for President. Part of building a viable democracy is building the habit of elections and change-through-elections. Since the incumbent is barred from running again (two-term limit), a new President must result. 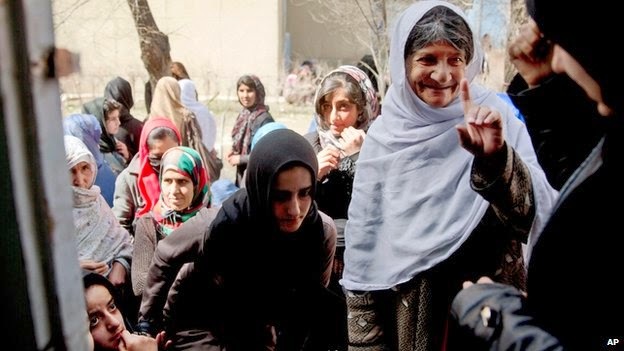 Afghan women register to vote. The high turnout is encouraging, especially as the Taliban threatened to disrupt the election, and there were some killings. But more is required for a free political outcome than elections: a viable democracy requires a viable state which requires lots of day-to-day habits and expectations. Still, having a high turnout election successfully conducted is a positive sign, just not a definitive one.